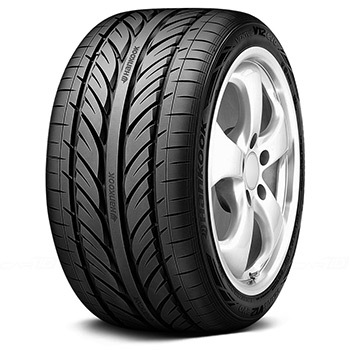 Hankook Ventus V12 EVO K110 is a premium tyre meant for high-performance saloons and sports cars. The internationally acclaimed tyre delivers an ultimate performance in both wet and dry situations. The Ventus V12 EVO K110 combines high-end safety and better control alongside superior steering precision on the highways at high speeds. The performance tyre features innovative HPSR rubber compound and the patented MTR profile by Hankook, which arms it with notched shoulder ribs for extraordinary performance. The dry and wet performance rating of the Ventus V12 EVO K110 has been rated the highest by Hankook followed by comfort and wear. The class-leading radial tyre gets low rolling resistance which results in better fuel efficiency and lesser release of CO2 emissions. The Ventus V12 EVO K110 produces lower levels of noise, resulting in a peaceful and soundless ride. A three-dimensional effect is provided to the tyre in the form of 3D effect on the block edge that ensures even distribution of pressure while braking. Hankook Ventus V12 EVO K110 tyre has been given a solid rib block in the centre which improves the braking performance and ascertains better steering response at higher speeds. The wide linear grooves and Y-shaped design efficiently directs water through its imprint and helps it perform excellently under wet conditions and provide better resistance to hydroplaning. It has a high-density nylon belt that improves the durability of the tyre and provides it a stable and firm cornering ability. The Ventus V12 EVO K110 has been engineered with a 3D tread design through which the ground contact pressure is dispersed equally leading to superior handling and braking. The ultra-premium tyre from ‘Ventus’ range is well suited for highway drives and extensive track use. The unique wear resistant compound in the tyre offers longer tread life, while the supple sidewalls get you related comfort while cornering during high-speed drives.